‘Denial’ is a film that attempts to dramatise a landmark court case at the turn of the century between an esteemed historian and a university professor surrounding the holocaust. To call David Irving (Timothy Spall) an esteemed historian is to reflect his standing prior to the court case and not his reputation now, which has rightly been destroyed by the court case and the evidence about how his racist and anti-semitic views led him to purposefully misconstrue historical fact. 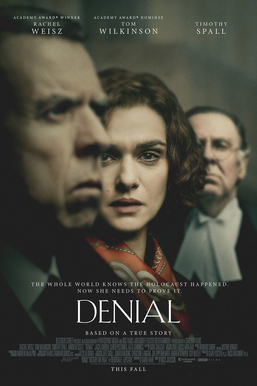 The film is about the trial and the details surrounding it, namely that in a libel case in a UK court the burden of proof is on the accused, leading to Deborah Lipstadt (Rachel Weisz) and her legal team to effectively prove that the holocaust did occur. This would prove more challenging than suspected and the film poses an interesting question towards the beginning for its audience to ponder – we know it happened but how can we prove we know? The central premise is interesting and it’s the kind of thought provoking drama I’m generally drawn too, but I thought ‘Denial’ was a little too forensic in its approach and it’s most effective when it follows more of a documentary style approach to the material. I felt the attempts to establish personal subplots didn’t really work, and I got the feeling that some material had been cut out at times (there’s a strange scene with Caren Pistorius’s character and her boyfriend that emphasises this point). For the most part, it’s fairly tasteful in its portrayal of a difficult subject (the Auschwitz scenes are very tastefully done), although it still can’t resist a couple of hamfisted moments with a survivor as if to hammer home the importance of the film’s point. I did particularly enjoy the scenes in the courtroom when the film allows its characters to make their cases and it wisely allows, as the legal team did, David Irving enough rope from which to hang himself as opposed to focusing purely on his evil views. Irving is an intelligent man and the film benefits from allowing screentime to him to make his case, therefore making the drama stronger when Lipstadt’s legal team prove him wrong and shut him down. In Timothy Spall’s hands, David Irving is a clearly hateful person, but between Spall and the script, I thought the film did attempt to be fairly even handed (as much as you can be with these circumstances) and the film is all the better for it. As Lipstadt, Rachel Weisz puts on a convincing accent and a solid performance, even if we’re rooting against Irving more than we’re rooting for her, and there’s some good work from the likes of Tom Wilkinson and Andrew Scott in the supporting cast. This isn’t the powerful and moving piece of filmmaking that I’m sure director Mick Jackson intended, but it is a satisfying drama about its interesting subject matter and I did enjoy it.